In 376 C.E., the Visigoths’ lands around the Danube River were being invaded by the Huns, so they pleaded for the help of the Eastern emperor, Valens. 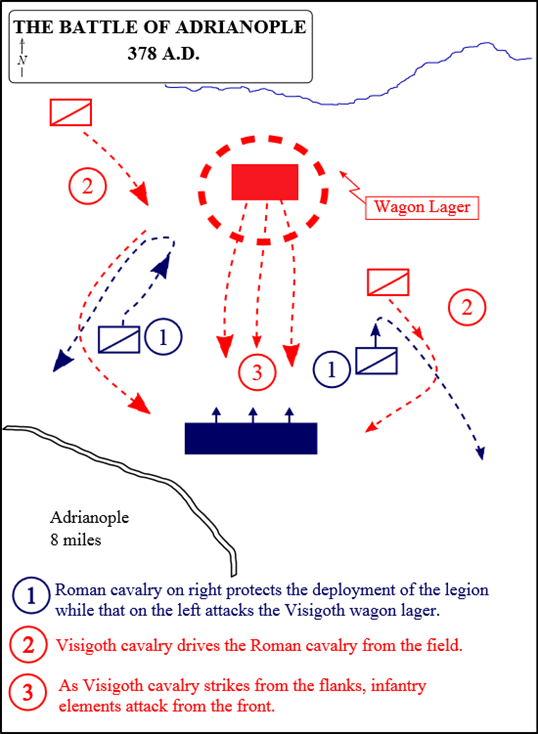 The Ostrogoths also sought refuge, and Valens saw the situation as a great opportunity to strengthen his position. By allowing the Goths to settle across the Danube, he could get “hardy troops as well as revenues,” giving him a great advantage over his enemies (Burns, 1973, p. 336). So Valens “allowed the Visigoths to cross the frontier and settle in Thrace,” under the condition that they “surrender their arms and submit all male children as hostages” (Scarre, 2000, p. 228; Bunson, 2002, p. 5). Not long after Valens let the Goths settle within the Empire’s borders, a “general rebellion threatened the entire Danube front,” all thanks to the “avarice and extortion” of the local Roman officials (Bunson, 2002, p. 5; Scarre, 2000, p. 228). The administrators failed to meet the food demands of the many Germanic peoples, which led to a lot of tension among them. As a sign of good faith, a Roman commander called Lupicinus led a large group of Goths to Marcianopolis, a city where he said they would be fed. Instead there was a plot to eliminate the German leadership. Luckily for the Goths, it failed, and one of the leaders that managed to escape Marcianopolis, the Visigoth chief Fritigern, led them in retaliation. After a victorious battle against Lupicinus, Fritigern and his men “armed themselves with Roman arms” and prepared to meet more of their so-called protectors in battle (Burns, 1973, p. 338). It seems the Goths often armed themselves with the fallen Romans’ superior equipment, which must have added to their humiliation when they lost against their own weapons! While the Western emperor Gratian was working to deal with the angry Goths, Valens realized that he had another opportunity to better his standing- not only to put the barbarian uprisings to rest, but to receive recognition for the great achievement. So in 378 C.E., Valens marched his army of around 60,000 men against the Gothic force of over 100,000 (Bunson, 2002, p. 5). Overestimating his chances, and refusing to wait for Gratian’s legions to arrive, he came upon the Gothic laager (wagon camp), and both armies formed up to fight (Burns, 1973, p. 342). The two armies “dashed together like beaked ships” and alternated in intensity “like waves at sea” (Ammianus Marcellinus, 1939 Trans., p. 473). The Visigoths were pushed back into their wagon camp, but like cornered animals, they refused to give in. Once the Goths managed to overwhelm the left wing of the Roman army, though, the tide of battle quickly turned. As the image below illustrates, the Gothic cavalry (mostly Ostrogothic) was also able to flank the Roman line and surprise them, dealing heavy casualties (Elias84 (Wikipedia), 2010). Amid the chaos, the Roman line fell apart, and they all “scattered in flight over unknown paths,” abandoning Valens’ dream of glory (Ammianus Marcellinus, 1939 Trans., p. 477). Even some of Valens’ great generals made a hasty retreat to get away from the onslaught of the frenzied Germans. Because of the lack of good leadership and the might of the German army, the Roman forces became helpless, but in spite of realizing all hope was lost, they still fought on. Some say that the Ostrogoth charge “revitalize[d] military tactics for the next thousand years,” showing the effectiveness of shock and awe battle tactics (Bunson, 2002, p. 5). Emperor Valens, along with 40,000 Roman soldiers, was slain in battle, although his body was never found (Ammianus Marcellinus, 1939 Trans., p. 479). The battle at Adrianople was a major sign of the Roman Empire’s decline. The loss of an emperor was irreparable, and on top of this the Romans were never able to “defeat and disperse this vast group of barbarian tribesmen,” instead offering them land and allowing them to serve as foederati (non-Roman nations that would provide military assistance) (Burns, 1973, p. 336). Perhaps if Valens hadn’t gone off to be a hero, he and Gratian could have mustered up a large enough army to crush the Gothic rebellion, but it seems his pride, like so many other Roman generals before, was his downfall. As a result of the great upset at Adrianople, the barbarians knew they could press the boundaries, that the ideals of Rome were far from invincible, and that it was only a matter of time before Rome itself would fall. Ammianus Marcellinus. (1939). Ammianus Marcellinus Volume III (J. Rolfe, Trans.). Cambridge, MA: Harvard University Press. Bunson, M. (2002). Adrianople. In Encyclopedia of the Roman Empire (p. 4-5). New York, NY: Facts on File, Inc.
Scarre, C. (2000). Chronicle of the Roman Emperors: The Reign-by-Reign Record of the Rulers of Imperial Rome. New York, NY: Thames & Hudson.